So check out my latest find, which is free today through January 25, 2014. If you are reading this post after that date, rest assured this book is worth the money. You have nothing to lose, as Amazon has an amazing return policy that could not be easier. But that won't be an issue in this case. This book is called Black Collar by Daniel Sullivan and it is Book One in the Uncommon Rebels Trilogy. I love that there are more to come! I love finding a good book and then waiting for more in the series (like Christine Shuck's War's End Book One). Five unlikely friends struggle to expose an American aristocracy hell-bent on oppressing the unruly working class. MIT graduates Hart Galliston and Rockle Farnsworth are two weeks away from unveiling their revolutionary new display technology at the Consumer Electronics Show in Las Vegas when a deadly chance encounter pits them against Senator Martin Lancaster. Hart and Rockle seek vengeance by pursuing one of Martin's daughters, the infamous socialite Brielle Lancaster. However, all is not what it seems with Brielle. Soon she and her two siblings join Hart and Rockle on a quest to expose the American aristocracy's purposeful oppression. Hart and his friends are uncommon rebels: a computer engineer, a programmer, a debutante, a cable news anchor, and a street artist. 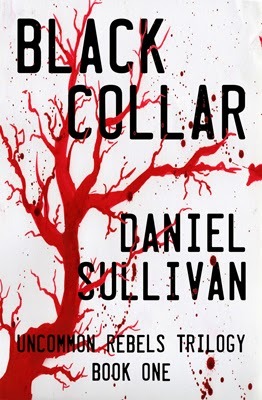 Daniel Sullivan's Black Collar thrills with unpredictable twists and meaningful details, captivating as both a modern social commentary and a dark suspenseful read. Grab this one while it's hot. It's about to break the Amazon Top 100 Free Ebooks, which is a very big deal! Daniel is doing something right, and you have to jump on this train!